For the months of February and March Sherwood Veterinary Clinic is supporting National Pet dental months with inclinic promotions. Call the clinic at 587-269-4000 or drop by to learn more about pet oral health and how our practice can help you and your pet. Sherwood Park Veterinary clinic is proud to serve Sherwood Park, Strathcona County and surrounding areas for all of your pet needs. We have highly experienced veterinarians and personnel to serve you and your pets 7 days a week in order to accommodate for both busy lifestyles and unanticipated emergencies. Sherwood Park Veterinary Clinic strives to achieve a superior level of care for all pets and our devoted staff is well trained in handling any urgent medical and surgical health needs that may arise. Our mission does however go beyond the technical aspects of medical care. Our staff is committed to educating our clients on ways to keep their pets healthy and happy though good nutrition, lifestyle and dental maintenance. We believe that the passion displayed by each member of our team reflects in each visit as our family works to serve yours. I am married and have three grown sons. I was born and raised in Egypt. Where I witnessed many cats and dogs being neglected, which inspired me to dedicated my life to helping animals. I trained in Egypt and after graduating, I spent ten years in Egypt working had to do my best for all the animals I could help. I moved to Canada in 1994, and enrolled in the University of Prince Edward Island Veterinary School, where I continued to expand my training and skills prior to completing the Canadian Veterinary Board exams. After graduation, I moved with my family to Swift Current, Saskatchewan for one year of work, then to Edmonton where I worked in a few practices around the Edmonton area. In 2015, I decided to fulfill my dream, and opened my own clinic in Sherwood Park. In my free time, I like to travel and spend quality time with my family. Dr. Matta moved to Edmonton 12 years ago with his family. He volunteered at Edmonton Humane Society for about a year, and then started practicing at small animal clinics. He also spent time practicing in emergency clinics. 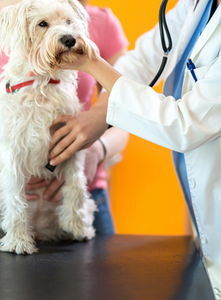 He is now co- owner of Sherwood Veterinary Clinic and especially enjoys medical cases involving skin disease and surgery. At home, Dr. Matta enjoys his cat, Arlene, and his family. He also enjoys youth outreach, fishing, tennis, and chess. Tammy was born and raised in a small town in New Brunswick. She moved to Alberta to go to college to become an Registered Animal Health Technologist, graduating from Olds college in 2009. Then back to New Brunswick she went for almost 6 years working as an RAHT. She returned to Alberta in September 2015 to live in Sherwood Park. Tammy shares her home with her husband Jason, five wonderful rescue cats, Milo, Scruffy, Dewey, Annie and Finnegan. As well as their 5-year-old Yorkshire Terrier Belle. "Dr. Bishay, Dr.Matta and all the staff at Sherwood Vet Clinic are truly the best!! After I rescued my 14 year old dog, Joe, I brought him to Sherwood Vet and they went above and beyond for us and treated him like a king! I will never go anywhere else and they are the only place I recommend to others. Not only this, but their prices for everything is beyond reasonable. Thank you guys for everything you do! Joe loves you guys and so do I!!" "Dr. Bishay Did a fabulous job on our little kitten Olive, she went in to be spayed and declawed and we picked her up same day and that night she was running around like nothing had happened. We tried to keep her in the kitchen as we didn't want her straining anything or having sore feet but that didn't stop her she was up on the bar stools and playing with all of her toys. All I can say is he did a fantastic job because our little kitty had no pain she was her usual self right away! I'd highly recommend him and his prices are reasonable."